AKB48 38th Single [Kibouteki Refrain] (FULL MV.) from Valen S. on Vimeo. In what may be a very shocking but pleasant surprise, AKB48’s graduated golden girls Maeda Atsuko, Shinoda Mariko, Itano Tomomi and Oshima Yuko were featured in the music video of AKB48 38th single “Kibouteki Refrain”, set to release 26th November. Starting with Takahashi Minami, the centers in the history of AKB48 showed up one after another, running a relay race to pass on 2 golden microphones. This action signifies the passing on of the center position. Watanabe Mayu and Miyawaki Sakura eventually receive the microphones and perform live with the rest of the senbatsu members. There are lots of running scenes in this music video, which is also the theme for the jacket covers. The single comes in 4 types in both regular and limited editions. Kojizaka46(centered by Kojima Haruna) will also have their first original song “Kaze no Razen” plus MV included in Type D.
The drama is adapted from manga of the same title. Oguri Shun plays a high schooler who gets transported back in time to 1549 during the Sengoku era. He has to battle the weaknesses in himself to live as Nobunaga Oda, a warlord who unites Japan. 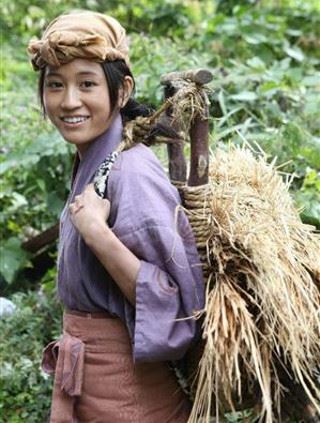 Maeda will be playing a village girl called “Oharu” who Oguri Shun meets by chance. The episode is set to air on the 27th October. This will be the first time both Oguri and Maeda are acting together. Getsu9 and Oguri Shun….Acchan’s got a good project this time, despite her role being really minor. With the recent expose on Onoe Matsuya’s fling with a woman 11 years older than him, attention has now turned onto how Maeda Atsuko will deal with her boyfriend’s infidelity. Maeda Atsuko had started this relationship with marriage in mind. In return, she had expected Onoe Matsuya to be serious about it too. The 2 often date indoors, and this eventually led to cohabiting. However, this also means that they can see each other’s faults and arguments. A showbiz staff claims that Maeda had declared to her male actor friends that she wouldn’t cheat, and even reports her dinner plans with male friends to Onoe. In return, she also expects Onoe to do the same, and when he’s being evasive, she would question him further. Now people are worried about Maeda’s mental state after finding out that she’s been cheated on. However, her rival is a successful woman with brains and beauty. What will Acchan do? Kabuki actor Onoe Matsuya and ex-AKB48 ace Maeda Atsuko’s relationship is full of twists and turns. The two started their relationship in March 2013. In early June 2014, news sources reported about their breakup but soon enough, the two reconciled. However, Onoe Matsuya’s womanizing ways may perhaps be the wake-up call for Maeda to end this relationship. On 6th June, Maeda Atsuko met up with fellow actors/actresses from drama “Q10” at a Izakaya in Tokyo. These friends were Emoto Tokio,Takahata Mitsuki and Sosuke Ikematsu and they collectively call themselves the “Uglies”. A reporter from Bunshun apparently sat nearby and was able to capture their conversation. It was Maeda who first revealed that she and Onoe have reconciled, as he told her he still likes her. She had gotten into an argument with Onoe but decided to forgive him after he showed up at her doorstep looking “cute” after catching a cold. She revealed that her relationship with Onoe is pretty smooth now and is even ready for marriage as she likes him alot. As if playing with Maeda’s feelings, Onoe Matsuya was captured kissing a woman in her 40s inside a taxi. The woman is later said to be a radio producer and a divorcee with children. Onoe had guested on her radio show in March this year. Before they separated ways, he even asked her when they would meet next. Onoe then headed back to Maeda’s mansion. Maeda Atsuko and Matsuya Onoe have broken up? There seems to be some updates on the relationship status of Maeda Atsuko(22) and Matsuya Onoe(29), since news of them dating came out in September 2013. According to the latest issue of Josei Shukan, the 2 seemed to have parted ways since the end of last year. The management agencies for the 2 had no comments on this matter. So news crew went to interview Matsuya’s mother, who gave full approval for her son’s relationship with Maeda last year and even said that she wouldn’t mind if her son got married the next day. However, this time round, Matsuya’s mother claims that she did not know if her son broke up with Maeda, and even said that she’d prefer her son to marry past the age of 30. In another article, it is said that whilst the 2 of them have never commented on their relationship publicly, they seemed to be dating secretly in a mansion. However, over time the relationship dissipated. “I heard from people around him that he broke up at the end of last year. The news of his relationship got too big and Maeda was troubled by it. I don’t know how they communicated after that, but they did not meet subsequently. As they did not admit to the relationship, there is no reason to answer they asked by the media,” said another insider. Actress and also a singer, Maeda Atsuko held her first solo live “SEVENTH CHORD” at Zepp Tokyo today. After graduating from AKB48, her chance to mingle with the fans has drastically decreased. During today’s reunion with 2700 fans, “I usually pretend to be tough and don’t say this but, I will be crying today” Maeda said with a bashful grin while wiping her tears. At first, Maeda had enthusiastically said, “This is the 1st time for me to have a proper live. I’ve gotta show something that is worthwhile” but something unusual came over her on the 5th song, the ballad “Migikata”. Her voice was choked up multiple times & fans ended up singing on her behalf during the 2nd chorus. It is proceeded by “Kimi ha boku da” where she cried while holding her forehead. She held both hands together as a sign of apology but the crowd wrapped her up with a big warm “Acchan” call. “The song & everyone kinda overlapped so… I’m really sorry…” Maeda laughed wryly. “It’s only the first 5 songs. But you would probably have thought that I was singing the finale” she made fun of herself, “Sorry for getting all emotional by myself there”. Fans who had waited long for “singer Acchan” showered her with words like “Welcome back!” “Aitakatta” “We’ve been waiting”. While holding her hand over her heart, she replied tearily, “Being on my own (solo) means that it gets harder to meet everyone, it has been lonely. So I’m glad I get to meet everyone today”. This live was supposed to be in commemoration of Seventh Code which was released last month but probably because she had been crying & was shaken up, she asked airily “It has been half a year since the release last year right?”. It was promptly corrected by the fans and she seemed flustered and replied, “Eh, it was released in March? Not October (last year)?” where the audience was subsequently enveloped in further laughter. 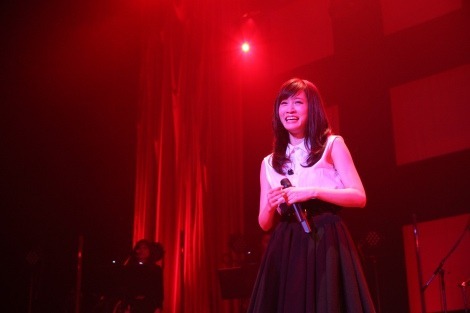 With a live band backing her up, Maeda sang a total of 18 songs enthusiastically for 2 hours. “I’ve gotta make more opportunities to meet everyone like this” she said at the end, making a promise for a reunion with her fans. 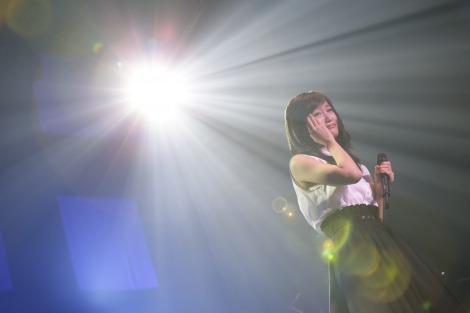 Ex-AKB48 ace Maeda Atsuko’s solo concert was held on the 3rd April at Zepp Tokyo. However, sales of tickets on the day itself have become a controversial topic on the internet. Her single “Seventh Chord” released on 5th March contained a serial number which allowed preorders for her concert tickets. However, tickets were not sold out so normal sales started on 22nd March. This has caused a sensation on the internet, as people commented “To think that she’s actually not that popular…” and “Is this reality for the ace of a national idol group?”. The last day of her concert is on 4th April, at Zepp Namba, Osaka. I checked Yahoo auctions for tickets to her Zepp Namba concert and it’s true that people are selling them off at cheaper prices. Starting bid is 3000 for the 5400yen tickets. This doesn’t seem good for Acchan esp since her single sales have been dropping drastically….even if there’s only been 2 releases after her graduation. I guess alot of her fans have moved on.